In this installment of my “On The Road With Sensei John” series, I want to discuss the various Dojo that I visited during my three and a quarter day journey from New Jersey (USA) back home to Arizona (USA). I will classify and present the Dojo in terms of their geographic relation to the Mississippi River. In this installment, I will discuss the Dojo that are east of the mighty river. In accord with my ideology of Jiriki Kata-Do, each Dojo visit sets forth a lesson that applies not only to Karate-Do, but also life itself. Once again while the within article is written in terms of Karate-Do, the concepts and ideas apply to life in general and are submitted for the benefit of all my readers. I hope you enjoy reading about the various Dojo. 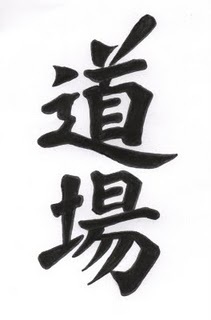 Kanji for the word "Dojo"
While I have a fond place in my memory for these traditional Dojo, the treasured and warmest recesses of my past memories and my present day training are to be found in the plethora of non-traditional Dojo that I have trained in. I was first introduced to a non-traditional Dojo by Sensei Nick D’Antuono (See Endnote # 1). My first training in a non-traditional Dojo occurred on a bright, sunny Saturday morning during the summer in or about the year 1972. It was the first time I trained outside the confines of Sensei DeFelice’s Goshin-Do Karate-Do Dojo which was then located at 125 Broad Avenue, Palisades Park, New Jersey. This non-traditional Dojo was, if memory serves me correct, located on Grand Avenue, again, in Palisades Park. The entire Junior Division, which then was represented by two separate classes (Beginners and Advanced Students) was to meet at the traditional Dojo. Sensei Nick instructed us to wear our Gi (Karate uniform) and sneakers. We would travel to the non-traditional Dojo by foot. At the appointed hour, the entire student body exited Sensei DeFelice’s Dojo and through a combination of walking and jogging proceeded along Broad Avenue. We then turned right, down a hill and arrived, about one-half hour later, at the non-traditional Dojo. It was indeed beautiful. It was, in fact, a park. This was to be my first training experience outdoors in nature. Since then I have had substantially many more such training experiences. In fact, though I trained weekly at Shihan Norlander’s Dojo in Bogota, New Jersey, when the weather permitted, I trained daily at my natural Dojo located in Hasbrouck Heights, New Jersey. At The Woodland Park Dojo to the sound of woodpeckers Chloe guards against squirrels. Another natural, non-traditional Dojo that I trained at was the Ling Dojo in Hackensack, New Jersey. I had not planned on training at the Ling Dojo. My decision to train at this Dojo was utterly spontaneous. Therefore, the lesson to be learned from the Ling Dojo is Unqualified Spontaneity in training and in life. I was scheduled to start my road journey on Saturday, April 17th. My last training session at Shihan Norlander’s Dojo was the night of Wednesday, April 14th. At the conclusion of the training session, I said my formal “Goodbyes” to all. Though once I say good-bye, I do not tend to linger or dwell, I arranged with Shihan Norlander to have a late breakfast at a diner in Hackensack, New Jersey. The diner is located on the Hackensack River. I arrived a few minutes early. The day was beautiful and I was enraptured with the surroundings, the satisfaction of being ready to hit the road and the idea of returning home after many months away. I decided to celebrate by performing a few Kata as I waited. I looked around so as to locate a suitable Dojo and found the Ling Dojo directly adjacent to the Diner. 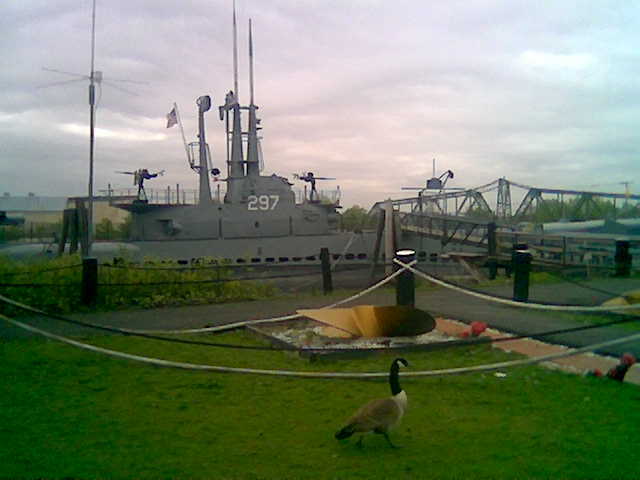 The Ling Dojo is a park adjacent to and part of the USS Ling submarine which is permanently housed on the Hackensack River. 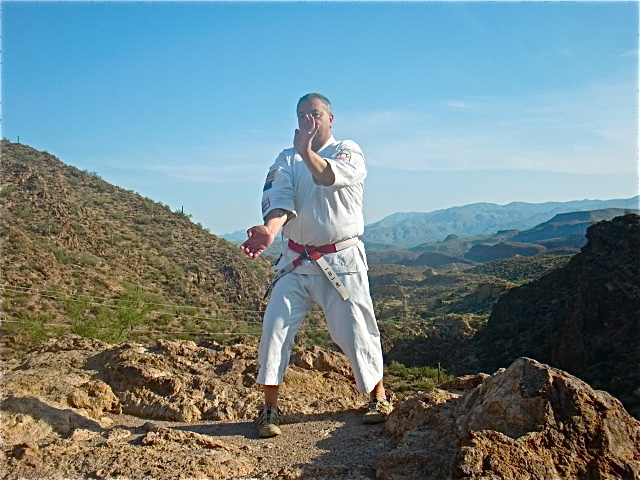 As I knew Shihan Norlander would soon arrive, I decided to begin training with a relatively short Kata called “Seipai”. With my blood flowing and mind clear, I then proceeded to perform the shortest Kata in the Goshin-Do Karate-Do Mokuroku No Kata called Ananku. As always, I ended the training session with the Sanchin Kata (See Endnote 2). At the completion of the session, I walked across the parking lot. As I did so, Shihan Norlander drove into the parking lot. Invigorated by my spontaneous efforts, I joined him for a very satisfying breakfast and discussion. So, my dear readers, remember the lesson of the Ling Dojo – be spontaneous in not only your training, but also your life. To be sure, planning the present and the future has merit, but true beauty, imagination and fulfillment is to be found in those unplanned moments that are simply allowed to happen. At long last, the time for Chloe and I to actually turn the ignition key and begin the drive home arrived. I said a final “Good-bye” to my Mom and Dad. At 5:00 am Saturday, April 17th Chloe and I drove west on Highway I-78. I had carefully planned my first day on the road so as to arrive at the first Dojo in the early afternoon. After about two hours of driving on I-78 West and one stop to refuel, Chloe and I turned South onto Highway I-81. The first Dojo is located on this Interstate Highway in Raphine, Virginia. We soon exited the State of Pennsylvania and quickly drove through Maryland and West Virginia. As I saw the “Welcome To Virginia” sign, my anticipation grew. I simply could not wait to arrive at the first Dojo of this trip; Smiley’s Dojo. By early afternoon Chloe and I finally reached exit number 205 and turned off the interstate. Smiley’s Dojo was less than a quarter of a mile away. My anticipation had reached a crescendo. I could tell by the way Chloe stood against the passenger door window frame and deeply breathed in and out that she too anticipated visiting Smiley’s Dojo. It is for this reason that the lesson to be learned from Smiley’s Dojo is Self-Discipline. Smiley’s Dojo is located within the confines of Smiley’s BBQ Pit. At this point in my day, I had eaten a simple breakfast consisting of a few pieces of fruit and some water. I normally eat a fairly regulated diet. Smiley’s Dojo is one of the few culinary indulgences I will allow myself on this trip. 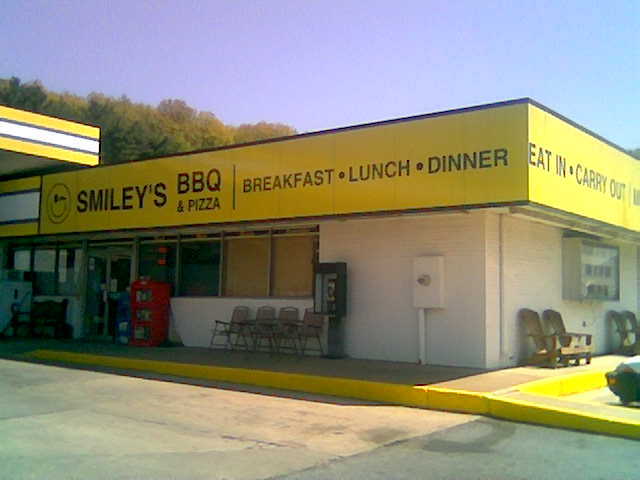 I can wholeheartedly say that the Carolina-style BBQ available at Smiley’s is the best. Further, the sliced beef brisket is second to none I have ever eaten in all my travels. By the time, I drove into the parking lot, I was quite hungry; however, Smiley’s Dojo is one of self-discipline. So, I first filled the truck’s gas tank. 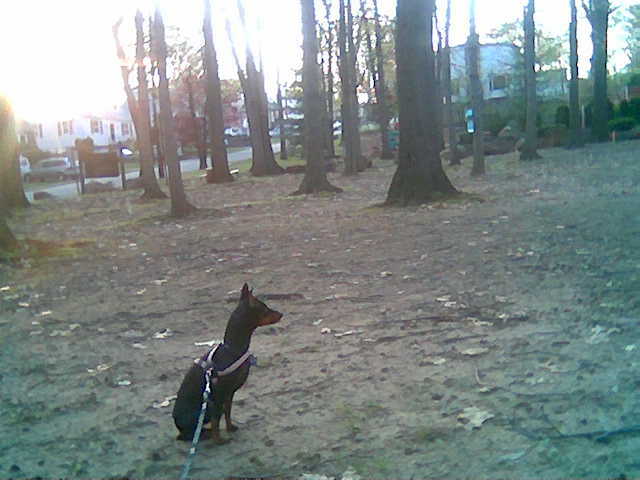 I then drove to the rear of Smiley’s and walked Chloe. I poured her some water and while she drank and stretched, I performed the Kata Tensho, Gekisai and Chinto. My performance was appreciated by various truck drivers who interrupted their own BBQ lunch to watch. We chatted a bit. Finally, I entered Smiley’s and placed an order “to go”; one pulled pork sandwich and one sliced beef brisket both in the Carolina-style of BBQ (See Endnote # 3). My order was cooked. With sandwiches and a souvenir jar of Pickled Okra and Picked Sweet Watermelon Rind in hand I walked back to join Chloe in the truck. You would think that I immediately partook of the flavorful bounty. No, I did not. Again, Smiley’s Dojo is all about self-discipline. Rather than allow my taste buds to wander wantonly amongst the smoky meat, I again drove south. A few miles down the interstate (around exit 199) is a rest stop with a very nice park. I exited the interstate and found a quiet parking space. To fully embrace the self-discipline of Smiley’s Dojo, I again delayed tasting my BBQ bounty. Chloe and I once again exited the truck with our BBQ treasure. We found a suitable tree-lined small meadow. I opened the bag and deeply inhaled the smoky, hallucinogenic fumes and immediately thought – I must perform another Kata. The question was, “Which Kata will adequately capture the self-discipline of deferring eating this intoxicating feast of smoky meat?” The only answer was to be found in one of the longest and most unique Kata of Goshin-Do Karate-Do; Kanto Kata. The performance of Kanto Kata is long and rhythmically methodic. It is described by Goshin-Do Karate-Do aficionados as being like “A hibernating bear rudely awakened in his cave and sleepily walking into the daylight to pursue his interloper“ (Isn’t that right Sensei Bob?). In the meadow, I performed Kanto Kata. Finally, I opened both sandwiches, cut each in half and ate half of each type of sandwich. I saved the other half of each sandwich until later for dinner. Chloe and I took a few minutes to lay down on the grass and let the sun’s rays fall gently upon us. My lips still tingled from the delights of smoked meats, my muscles twitched with the exertion of Kata and my spirit was a-flutter with the joy of life. As Chloe and I sat up and walked back to the truck, a butterfly landed on the grass where we had just laid. I entered the truck and turned the ignition thinking, “Life is indeed good.” I hope we all can carry the lesson of Smiley’s Dojo with us each day and remember well the rewards of self-discipline. Chloe and I ended our first day on the road in White Pine, Tennessee. We had driven about 825 miles and had a most enjoyable day. After finishing the remaining BBQ sandwich halves from Smileys, a walk for Chloe and a performance of Sanchin Kata, we soon settled in to bed. I wanted to begin the second day on the road at about 5:30 am the next day. Chloe and I would enter the state of Tennessee and turn west onto Interstate 40. We would also visit the Dojo of a famous country and western singer. Chloe and I awoke early Sunday morning, April 18th. As planned, we were driving on the interstate highway by 5:30 am eastern standard time. After driving a few hours, and gaining an hour when we passed into the central time zone, we arrived at the next Dojo which is at exit 143 on highway I-40. Due to the fact we gained an hour of time, it was only about 7:30 am when we pulled into the parking lot of the Dojo located at Loretta Lynn’s Country Kitchen. Chloe and I did not enter into the restaurant to eat its many wonderful culinary offerings. We had many miles to drive today, so we stopped at this Dojo only to let Chloe walk a bit and so that I could perform Kata in this famous singer’s “Dojo”. Much like the story of Loretta Lynn, who rose from her humble beginnings as a “coal miner’s daughter”, a Kata performance at this Dojo, particularly in the early hours of a dawning new day is filled with inspiration. The lesson of the Loretta Lynn’s Dojo is Inspiration. 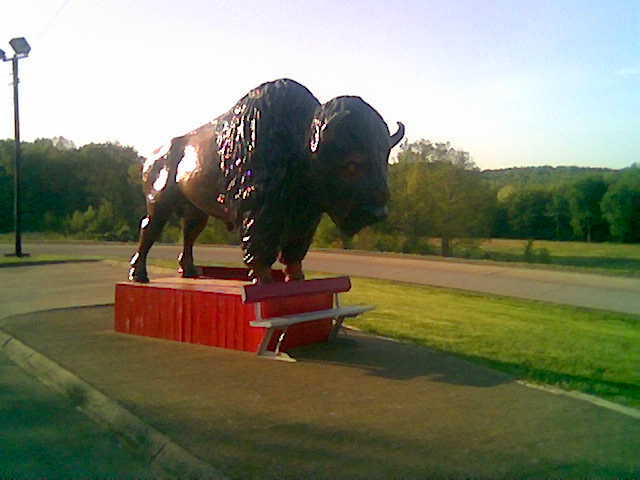 Chloe and I found a suitable location for her walk and my performance adjacent to a statute of a mighty buffalo. I am particularly fond of performing the Goju-Ryu based Kata of Goshin-Do Karate-Do in the early morning. So, as I performed my Kata, including Tensho, Seienchin, Seipai and, of course, Sanchin. I allowed the rising sun, dew-filled grass and clean fresh air to inspire me to manifest the most fulfilling day possible. Each day, remember the lesson of the Loretta Lynn Dojo and allow yourself the opportunity to look within yourself as a source of your own inspiration. Allow yourself to go out into the external environment inspired to produce and manifest the most satisfying day. This will allow you to live a life enraptured by the events you inspired and manifested. The Loretta Lynn Dojo was the last “formal-natural” Dojo Chloe and I visited before we crossed the mighty Mississippi River. The crossing of “’Ole Man River” signifies the beginning of our western journey. The western portion of our trip will be discussed in the next installment of this series. Until then, please remember these parting words. The purest Dojo is located within the human heart and spirit. It is from within the pure Dojo that the truest Karate-Do (and an enlightened life) is to be found. 1. Sensei Nick D’Antuono was my first Sensei in Goshin-Do Karate-Do. At the time I had started my road trip back home, he was hospitalized with complications due to medical treatments for cancer. As of this writing, Sensei is no longer hospitalized. I am happy to advise, he is home. 2. Please see the Mokuroku No Kata category for a complete list of all Kata in the Goshin-Do Karate-Do system of Shihan Thomas DeFelice, including the Kata incorporated by me at Senior Yudansha levels. 3. Smiley’s also offers “Kansas City-style” BBQ which is slathered in a rich and tangy sauce. My favorite is the Carolina-style in which the meat is covered in a light vinegar based sauce. This style allows the true flavor of the meat to be experienced. For more on either Sanchin Kata as meditation or my new book on Sanchin Kata, please feel free to visit the “Sanchin Book” page of this Blogsite, or my website WWW.Dynamic-Meditation.Com. For more information on my ideology and methodology of Jiriki Kata-Do, please review the articles herein filed in the category “Kata as enlightened meditation“. Once again, it is April and time to make the road trip home to Arizona (USA) from New Jersey (USA). I have made this almost 2,600 mile “commute” over 20 times since 2004, including 14 times by motorcycle with my dog, Chloe (her picture may be found on the “Meet Sensei” page of this site). It is my custom that a few days prior to each trip, I re-read some of the great literary tales of travel and journey. The one book that accompanies me on every road trip is a dog-eared copy of On The Road by Jack Kerouac (Penguin Books, New York, NY, 1959). Now, as I pack this epic tome for yet another road trip, I thought it would be appropriate to share some of Kerouac’s musings with you and to encourage you to contemplate Kerouac in light of your Karate-Do and martial ideology. Again, the within is not intended to be the sole province of those fortunate to have knowledge of Karate-Do. Rather, the within can be viewed in terms of any art form or ideological endeavor. As with the earlier “Dojo Experiments” this article does not provide answers. Rather, through dialogue, the experiment prods you along the path of Karate-Do and life. And so, it is time to be, On The Road. Something, someone, some spirit was pursuing all of us across the desert of life and was bound to catch us before we reached heaven. Naturally, now that I look back on it, this is only death; death will overtake us before heaven. The one thing we yearn for in our living days, that makes us sigh and groan and undergo sweet nauseas of all kinds, is the remembrance of some lost bliss that was probably experienced in the womb and can only be reproduced (though we hate to admit it) in death. But who wants to die? Id. At 124. 1. If death is pursuing us through life, why do we insist on taking each day for granted? Make a decision to live the ideology of Ichi-Nichi-Issho (One Day-One Lifetime) which provides, inter alia, that today is your life. When added to yesterday, today forms links of a chain that is collectively known as a lifetime. So, if you want to train, train today. If you love your spouse, or child, tell them so today. Death is pursuing so grasp a hold of the “Now” and fulfill it – NOW. 3. If you practice your Karate-Do with a pure heart, can you now manifest and achieve the bliss that Kerouac feels is only reproducible in the womb? Is not Karate-Do the womb that incubates your persona to a blissful level? We had longer ways to go. But, no matter the road is life. Id. At 212. No matter where I live, my trunk’s always sticking out from under the bed, I’m ready to leave or get thrown out. I’ve decided to leave everything out of my hands. Id. At 251. With the above passage in mind contemplate how Karate-Do has prepared you to have your trunk’s packed; to be ready to spontaneously meet life’s challenges so as to enjoy its rewards. As my excitement of being on the open road soon approaches the crescendo moment when the key is turned and the engine roars to life, I have also re-read the following from the memoirs of General George S. Patton. I believe this passage also has insights into artful pursuits. All members of our oil-daubed civilization think of roads as long slabs of concrete or black-top, or at least as dragged and graded thoroughfares full of wheel ruts. As a matter of fact, roads, or it is better to call them trails, existed thousands of years before the earth- shaking invention of the wheel was even dreamed of, and it was along such roads that our sandaled or barefoot progenitors moved from place to place. . . It takes little imagination to translate the nomad on his white stallion and the men and women on donkeys into the Canterbury pilgrims, while the footman, equipped with large staff and poniard, can easily be mistaken for Friar Tuck, Little John or Robin Hood. This similarity applies not only to their dress, but also to their whiskers, filth and probably to their morals; and they are all talking, always talking. They have no recourse. There are no books, newspapers or radios to distract them. From War As I Knew It: The Battle Memoirs of “Blood & Guts”, General George S. Patton, Jr. (Houghton Miller 1947) pp. 44-45. As you train, and specifically, as you perform your Kata (or other art form) in a modern Dojo, or studio, consider the early ancestors of your art form as they trained, in sandals or barefoot, in nature. Consider how the art of these primordial practitioners compares to your art as it exists today. I hope the within Dojo experiments spur in you a reflective desire to contemplate and evaluate your Karate-Do or other chosen art form. Karate-Do is merely the mechanistic means of discovering that which we all desire – to know who we in fact are. And so, as I am about to drive north to south, east to west on (US) Interstate Highway numbers 78, 81 and 40, I will be thinking of you sincerely sweating, pondering, blissfully enjoying, your Karate-Do. I will visit a few Dojo along the way. Upon my return to Arizona, I will post a travel-log and pictures for your enjoyment and contemplation. Until then, I remain, on the road . . . of life. An expanded discussion of my methodology & ideology may also be found in my new book The Dynamic Meditation Rite Of Sanchin: Gateway To The Three Battles To The Plateau Of Human Serenity. Please see the “Sanchin Book” page of this site. The following is submitted for all journeymen who chose to live life rather than merely exist. Although the following tale is based upon actual events that occurred within my Karate-Do Dojo, named the Issho-Dojo (Lifetime Dojo), the concepts espoused apply to all who have found themselves in situations where external demands appear to impose a no-win situation. This article is respectfully dedicated to all who have suffered the so called ties that bind, binds that tie and the no-win situation. My Issho-Dojo, which at the time, was located in East Rutherford, New Jersey had many students pass through its doors. They learned from me and, as is the case in all true teacher-student relationships, I learned from them. The following events occurred one hot, steamy, humid New Jersey summer night. I was teaching the final class for the evening. Heat and humidity notwithstanding, I am not particularly fond of air-conditioning. As such, the Dojo is simply ventilated, through an open door with the assistance of a simple fan placed on the floor. I am not cold-hearted and do occasionally turn on the 20 year old air-conditioning unit. I find that if I flick the electric switch on for about a ten second duration every hour and then turn it off, the ancient cooling unit provides the faintest wisp of cool air. The most efficient cooling system in the Dojo is the human body which cools itself through the process of “bio-mechanical heat exchange”, commonly known as perspiration. In the Issho Dojo there is never a lack of such bio-mechanical heat exchange. With that background in mind, it must be understood that on that fateful evening, the Dojo was hot and steamy. There was only about ten minutes left in the final class when I noticed that one student named Daniel was beginning to tire. Daniel had trained with me for about five years and was a good student. Daniel was ranked as a Ni-Kyu (second grade) Brown Belt. Yes, five years and Daniel was “only” a brown belt (See Endnote 1). Daniel was also the “Dai-Sempai” (oldest Brother) of the class, and as such, had a bit of “clout”. Daniel was clearly showing the effects of the heat and humidity. Given the number of years that Daniel had attended the Dojo, he was self-assured in his physical capabilities. This indicated to me that it was time to challenge Daniel’s mind and spirit. I looked at Daniel and asked him, “Daniel, are you tired?” Daniel was forthright in his reply, “Yes, Sensei, I am.” Daniel was about to enter the realm of what is known as the “double-bind” situation. I addressed the student body, “Okay class, Daniel is tired so it is time for everyone to perform a Kata to wake Daniel up.” I then commanded the students and Daniel to perform a Kata. Now, to be sure, the last thing the students wanted to do was another Kata in the hot steamy Dojo. Further, it was clearly apparent that the group was not particularly fond of having to perform a Kata because Daniel, the Dai-Sempai, was tired. After the student body performed the Kata, I commanded them to line-up in the formation that would normally indicate the end of class. I again turned to Daniel and asked, “Daniel, are you tired?” Daniel was a quick learner. It was clear that he did not desire to have the group perform another Kata because of his tiredness. He stood straight and tall, looked me directly in the eye and responded, “Thank-you Sensei, I am no longer tired.” I appeared satisfied with Daniel’s reply. I addressed the students, “This is a lesson in the ability of Kata to rejuvenate.“ “Daniel was tired, and having performed Kata, he overcame his tiredness.” I then proceeded to tell the students, “Since Daniel has new found energy, we should celebrate his rejuvenation by performing another group Kata.” I again commanded the group, naturally including Daniel, to perform the most demanding Kata in the Mokuroku No Kata (catalogue of Kata). Once again I commanded the students to line-up in formation. I am sure that the students truly believed that class was now (finally) over. To capitalize on their belief, I asked Daniel to issue the command to have the students kneel in the seiza position. The kneeling seiza position is used to execute the formal bowing ceremony that starts and ends class. The anthropologist Gregory Bateson noted the similarity of the Zen Koan technique to the double-bind. The double-bind neutralizes the ego by paralyzing it (See Endnote 2). In this context, ego is defined as the conditioned aspect of self (see Endnote 3). The ego self cannot handle the no-win oscillation from one option to another in such a transaction as this: If you say this dog is Buddha, I will hit you. If you say this dog is not Buddha, I will hit you. If you say nothing, I will hit you.The imperative conditions that create the double-bind are (a) that two (or more) people are involved and (b) there is a bond between these two people that (presumably) cannot be broken. The situation is such that the person in the double-bind has temporarily surrendered his ego autonomy. Of course, once the jump to a new context of living takes place, an event called “satori”, the job of the master is accomplished and he lovingly releases the double-bind. The nature of the double-bind is that the “victim” cannot confront the inherent dilemma and therefore can neither comment on the conflict, nor resolve it, nor opt out of the situation. The double bind is often misunderstood to be a simple contradictory situation, where the victim is trapped by two conflicting demands. While it is true that the core of the double bind is two conflicting demands, the differences lie in how the conflicting demands are imposed upon the victim, what the victim’s understanding of the situation is and finally, who (or what) imposes these demands upon the victim. Unlike the usual no-win situation, the victim has difficulty defining the exact nature of the paradoxical situation in which he or she is. Typically, the demand is imposed upon the victim by someone who they respect (a parent, teacher and the like), but the demand itself is inherently impossible to fulfill because some broader context forbids it. (See Endnote 4). Let us re-examine Daniel’s dilemma. No matter how Daniel responded to my question or if he did not respond, I was going to command the class to perform a Kata. Daniel and the entire student body assumed that the alleged cause of the punishment (of having to perform yet another Kata) was Daniel’s purportedly unwise reply. Daniel voluntarily surrendered his ego to my questioning in fear that there would be a repercussion for an improper answer. By surrendering his ego, Daniel did not realize that there was no proper answer. Regardless of his reply, he and all the students would be required to perform a Kata. Daniel and the class were subject to my authority. They knew they could not decline my command to perform a Kata. For those readers that lack martial arts experience, it is axiomatic that within the Dojo, the word of Sensei is absolute law (by the consent of those governed) (See Endnote 5). In all the years since that eventful night for Daniel, I was always struck by the fact that not one student offered advice to Daniel as to how he should respond to my question. Suppose you were in the Issho-Dojo on that hot, steamy, humid New Jersey night, how would you assist Daniel, or better yet, if you were in Daniel’s place, how would you answer my fourth inquiry as to “Are you tired?” There are many possible replies. In fact, there is no “correct” answer. I offer the following reply as an answer which, had I received from Daniel, I would have released him from the bind. In this manner, Daniel, the victim, removes the threat of giving an “incorrect” answer. He freely and voluntarily accepts the so-called “punishment” in a manner in which the contentment of the punishment is denied to me as the instigative inquisitor. The result is that the dilemma no longer exists for the victim. I suggest that in either a double-bind situation, or in a perceived no-win situation, evaluate first, a change of context and second the severity of the punishment. If you can, redefine the context. In the Dojo tale, neither Daniel nor the class could change the context. By entering the Dojo they acquiesced their authority to me as their Sensei. (See Endnote 6). If you cannot redefine the context, then evaluate the severity of the so-called punishment. If the punishment (physical or emotional) can be borne without long-term dire harm, then break the bond by voluntarily undertaking the punishment so as to undermine the contextual authority and break the double-bind. The reader may wish to consider the evolutionary process of self-discovery as set forth in my article entitled Dante’s Issho Dojo which is filed in the category Martial Ideology & Life. For more on either Sanchin Kata as meditation or my new book on Sanchin Kata, please feel free to visit my website WWW.Dynamic-Meditation.Com. 1. For those martial artists who are accustomed to rank being linked to time spent at a Dojo, or the length of a financial contract, please see the Memorial Page of this blogsite so as to obtain an understanding of rank in Shihan DeFelice’s style of Goshin-Do Karate-Do that I teach. 2. Goswami, Amit, The Self-Aware Universe, (G.P. Putnam & Sons, New York, NY, 1993) p. 240 Citing: Bateson, G., Steps To An Ecology Of Mind, (Ballantine Books, New York, NY 1972). 3. Goswami, Id. p. 277. 4. Goswami, Id. p. 240. 5. This phrase comes from Shihan Peter Urban and may be found in several of his works, including The Karate Dojo and The Karate Sensei. Both are highly recommended. 6. The subject of escaping the double-bind by changing the context of the relationship is beyond the scope of this article; however, I offer the following illustration. Within the psychoanalytical field, there is the following illustration of a double bind imposed by a parent upon a child. A parent tells a child, “Do this task, or you will be punished.“ The also tells the child that such punishment is because “I love you”; however as this is said the parent physically frowns and turns their back to the child. Thus, indicating something other than the love espoused. As the parent walks away, the parent adds “Do the task only if you want to”. Psycho analysis says that the child is in a double-bind because 1) The task must be done, or they will be punished, 2) Punishment is doled out as a manifestation of verbal love while the physical body language of the parent dictates otherwise, and 3) an illusory choice is given to the child to determine whether or not to do the task. It is clear that the child cannot change the context of the relationship because the child cannot usurp the authority of the parent. I suggest that the child (assuming a sufficient level of emotional growth) can break the psychology of the double-bind by changing the emotional context as follows, “My parent, I will voluntarily perform the task because I desire to show you I love you as much as you love me.” I suggest that the statement breaks the (emotional) context of the double-bind. The within is submitted for the benefit of all life journeymen. The foregoing discussion of the Sanchin Kata is not intended simply as the divine province of those martial artists fortunate to know Sanchin. Rather, every person who reads the within should endeavor to learn the Sanchin Kata and perform Sanchin at least daily. Embrace Sanchin as a long lost lover and Sanchin will fulfill you with its enticing secrets. The Sanchin Kata is perhaps one of the most treasured Kata of traditional Karate-Do and the predecessor arts of Kung-Fu, Kalaripayat and Pranayama. Within my methodology and ideology of Jiriki Kata-Do, Sanchin Kata is made available to all who wish to learn and probe its benefits and secrets regardless of whether they wish to learn a full Karate-Do curriculum. To borrow from my article on this blogsite entitled Dante’s Issho Dojo (please see the category Martial Ideology Applied To daily Life), Sanchin is the portal to a new contextual paradigm for Kata to be found in Jiriki Kata-Do. This paradigm allows the three battles of Sanchin Kata to be extended into a new dimension. The translation of the Kanji for the word “Sanchin” offers insight into the attributes that are found within Sanchin Kata. As one may see from the Kanji, the word Sanchin is composed of two root words. The root word “San” means “Three” and the root word “Chin” means “Battle”. The word “battle” does not refer to warfare; rather, “battle” refers to conditions, or aspects requiring attention and cultivation by the performer of the Sanchin Kata. Thus, while Sanchin literally means “Three Battles” , the interpretation of the Kanji should be extended to mean “three aspects of the human condition.” Through the regular performance of the Sanchin Kata the three aspects of the human condition are incubated, nurtured and evolved so as to facilitate an enraptured human experience. Historically, the interpretation of the three battles of Sanchin Kata has been limited to a martial arts perspective. There are many interpretations of the three battles of Sanchin that are derived from the Art of Karate. The central theme of the Karate-Do proclamation of the three battles is the development and unification of body and spirit. This development of mind and body is fundamental to the practice of Karate. In general terms, the three battles of Sanchin have been described as: Breath, Posture and Spirit. All three aspects are to be unified through the Kata. Thus, historically, it can be said that the Sanchin Kata unifies the body (through the elements of breath and posture) and spirit (through the moving-Zen concepts) of the Karate-Ka (one who practices Karate). Such a unification of mind and body elements are essential to the practice and execution of Karate technique and Kata. Through the Sanchin Kata, the Karate-Ka forges a body that is tough and resilient. A Karate-Ka’s body would be as solid as the trunk of an oak tree and as flexible as the boughs of a willow tree. The spirit of the Karate-Ka would be fostered so as to allow the Karate-Ka to perceive the external world and act spontaneously in accord with the attendant circumstances. Through the Sanchin Kata, the Karate-Ka would achieve a superhuman perception. This would enable the Karate-Ka to be impervious to physical pain and discomfort. The Karate-Ka would also be immune to harmful emotions and spiritual distractions. This state of being forms the building blocks to Karate. The definition of the three battles of Sanchin within the boundaries of the perspective of the martial arts is, by its very nature, limited in scope. Further, the definition is redundant as it uses three manifestations (breath, posture and spirit, or similar expressions) of only two aspects of the human condition (body and mind). I note here that I am aware of a limited number of martial artists that define the three battles of Sanchin as the unification of body, spirit and “soul”. I submit that such a definition, while it appears hopeful in expanding the concept of Sanchin beyond the realm of martial arts, is dismally disappointing. One need simply explore the definition of soul to be disappointed. I submit that the soul is an improper aspect of the Sanchin Kata for the following reasons. The use of the word soul automatically (like Merlin’s magic wand) conjures up religious connotations that do not belong integrated within Sanchin. Even assuming, arguendo, that such religious inclinations can be suppressed, the traditional and philosophical view of the soul is that at some point it must reside within the human bio-body. Thus again, the definition merely draws upon conditions that exist within the human and fails to account for external universal-environmental factors. This failure results in the human existing as separate and distinct from the universal environment on both a physical and conscious level. For more than three decades, I have engaged in the practice of the Sanchin Kata. My devotion to Sanchin enlightened me to the discovery that the traditional proclamation of the three battles of Sanchin Kata was incomplete. The traditional proclamation of the three battles possessed a very sever limitation. The limitation is that three battles of the Sanchin Kata were expressed solely within the martial arts context and perspective. Such a perspective of the three battles of Sanchin merely describes two states of the human condition. These two states represent a limited view of the source of physical power, spiritual insight and emotional stability of the Karate-Ka. The two states of human existence I am referring to are a physical state and a spiritual state. To date, the unique attributes ascribed to a Karate-Ka, or any martial artist for that matter, were believed to be solely a manifestation and unification of the body and spirit (or mind) aspects of the human condition. After many years of continued rigorous practice of and devotion to the Sanchin Kata, I came to realize that clearly lacking from the definition of the three battles is an additional third human quality. It became apparent to me that the three battles of Sanchin must be allowed to break the limiting boundaries imposed upon it by the martial arts perspective. This means that the three battles must be viewed and defined from the perspective of the total human condition. The three battles of Sanchin, as expressed to date, account for two aspects of the human condition that are internal to the human (body and mind). It became apparent to me that the missing, heretofore undiscovered battle, or aspect, of the Sanchin Kata must be external to the human bio-body. I call this aspect the metaphysical aspect of the human condition. Just like the Tesseract shown below illustrates a standard three dimensional cube in a new paradigm of four dimensions, my ideology of Jiriki Kata-Do extends the three battles of Sanchin Kata into a heretofore undiscovered new paradigm, to wit: the redefining the three battles of Sanchin to recognize a metaphysical aspect of the human condition that exists external to the human bio-body. Further, by way of my methodology and ideology of Jiriki Kata-Do, the Sanchin Rite (this is a term of art I coined so as to avoid the use of the word “Kata” and the martial arts connotation of the word) is made available to anyone that desires to learn its secret teachings. 3. Meta-physical Battle, or the aspect of the expansion of etheric-essence into the universal environment to foster interconnectivity and synchronicity with the universal consciousness perceived through Sanchin. It is imperative to remove the boundary of the martial arts perspective and begin to think of the three battles of Sanchin within the overall perspective of the entire human condition. Such a boundless interpretation of the three battles mandates that factors that are internal to the human must be considered as part and parcel of factors that are external to the human condition (including those factors that may exist beyond the ken of human perception). I was awakened to the metaphysical aspect of the Rite of Sanchin Kata only after three decades of practice coupled with an introduction into newly developing sciences, including quantum physics, noetic sciences and traditional and non-traditional philosophic ideologies. To date, I am aware of no other Sanchin-Ka (A term of art I use to describe anyone who practices Sanchin) that has defined the three battles in the manner I set forth. Further, I am not aware of anyone that has promulgated a specific methodology and manner of performing the Sanchin Rite so as to experience the metaphysical aspect of the Rite (or Kata). Perhaps I am the only person willing to commit name and reputation to acknowledging the existence of a third, metaphysical aspect present in Sanchin. I am also confident that Sanchin can and should be learned by anyone who desires to embrace it and learn its secret teachings. Such knowledge can be undertaken independent of a full Karate curriculum. I have developed my methodology and ideology of Jiriki Kata-Do so as to grant practitioners the divine province of experiencing unification and synchronization of not only body and spirit, but the universal presence and consciousness. Through the understanding and development of the three battles, or aspects, of the Sanchin Rite, one can begin to foster an understanding of the state of human existence I call the Plateau of Human serenity. The Plateau of Human Serenity is the portal to the broader concepts of the human condition as explored through the various Rites (or Kata) of Jiriki Kata-Do. The Sanchin Book (which may be found on the Sanchin Book page of this Blogsite) sets forth the first installment of the Jiriki Kata-Do dynamic lecture and exercise series. The foundation of the Sanchin Kata presentation is the imperative nature of recognizing and awakening the potential gained by existing and synchronizing with factors that are internal and external to the human bio-body. 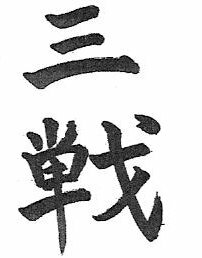 The Kanji for Sanchin Kata was taken from my series on the Mokuroku No Kata of Goshin-Do Karate entitled Goshin-Do Kata-Jitsu: Volume Three: The Goju-Ryu Influence (Issho Publications, E. Rutherford, NJ 2002). The use of the Tesseract was inspired by a reference made to it in Kaku, Michio, Physics Of The Impossible ( First Anchor Books, NY, NY 2009) p. 232. The graphic of the Tesseract was found on the Wikipedia website. The within is submitted to all who tread along life’s journey in a continuing search for knowledge and improvement of that amorphous concept known as “self”. Once again, on the surface, the within article would appear to apply simply to the martial arts. I suggest that on a broader level, the within applies to all aforementioned journeymen. Whenever a new student would enter the Dojo, I would ask the initiate what he or she hopes to achieve by undertaking the study of Karate-Do. The answers I receive from such potential initiates are as varied as the individuals themselves. There are, however, certain general themes that emerge. One such theme is the attainment of self-confidence. I would like to explore the effect of attaining self-confidence in this article. Initially, I note that I will not address the mechanics of how and why Karate-Do and other martial arts build self-confidence. I submit that it is axiomatic that self-confidence is discovered and nurtured through Karate-Do. The same is true of other art forms such as music, painting, Yoga and Zazen (seated meditation). In fact any endeavor that mandates periods of introspection by the practitioner will foster self-confidence as a consequence of self-discovery. Having said that, there is a crucial turning point in the evolutionary process of self-discovery that leads to the attainment of self-confidence. The turning point is at the event horizon when one’s self is discovered, realized and defined. It is at this event horizon that one’s awareness of oneself breeds a sense of self-confidence. Once self-confidence is attained, the event horizon dictates that one can undertake two possible future paths. The first path is the path that recognizes that the concept of self (and the associated self-confidence) is transitory and subject to continuing definition and evolution. This path is defined by the idea that while one is awakened to and confident in the person that one is, such a psychological state is merely momentary and subject to the continuum of the life experiences to be had. One’s deeds, ideas and actions are viewed as evolving. By this I mean that continued deeds, ideas and actions incubate and give birth to continued knowledge. Continued knowledge gives rise to new theories, concepts and innovations. Thus, one is confident within the boundary of acknowledging that such confidence extends to one’s ability to continue to embark on the unknown journey of life as it unfolds. If one lacked this confidence, the future unknown journey would stagnate one’s personal quest for knowledge and growth out of fear. On this path, the self-confident journeyman continues the quest in anticipation of unknown knowledge for the purpose of perpetually rediscovering oneself. The second path is the path that views one’s achievement in the chosen field of endeavor as the pinnacle of the discovery process, to wit: one has become the “best” one can be (The slogan, “Be all you can be” comes to mind). This means that one’s self-confidence is finite in place, time and achievement. This path is defined by ego. The path of ego mandates that one sees the continuum of life not as a process of continued discovery, but as a conclusion to be ratified by the remarkable person that one has become. One’s deeds, ideas, and actions are internally viewed (and to be perceived by others) as omnipotent and mighty. This means that one’s deeds are to be glorified in and of themselves. One’s deeds, ideas and actions are to be viewed as a historical event and as supreme and final. Of course, this is a fiction. Such self-confidence has fallen prey to the Siren’s call of ego. The paradox of this psychological path is that it results in a stagnation of personal growth to be attained by future knowledge. The result is similar to the stagnation experienced by an utter lack of self-confidence. In the former case the stagnation is caused by ego and in the latter case it is caused by fear. Thus, the fulfillment of the paradox. Everyone is susceptible to falling prey to the draw of one’s ego. So as to be able to fend off the attraction of succumbing to the mythical Siren‘s call of ego, one needs to always bear in mind the transitory nature of life. As much as one cannot rest on one’s laurels, one must always understand that accomplishment is but a portal to future achievement. This is not to say that one need be forever humble. One can, and should, enjoy the successful feeling that comes from accomplishment. One need simply remember that accomplishment which breeds self-confidence should be perpetually challenged and redefined within oneself. Again, there are many introspective endeavors wherein one can obtain a sense of self-definition and self-confidence. For myself, the mechanism is the continuous study of was Karate-Do and specifically, the study of Kata. The principle characteristic of any introspective endeavor is that it will eventually lead the practitioner to the event horizon of choosing the path of either continuing self-discovery through knowledge or to the path of finite ego. Ego is finite and, being self-propagated dissipates with time. History is replete with examples of the dilatory effect of ego as a factor of time. There are many examples contained in mythology, history and literature. One such example is the following poem, Ozymandias, by Percy Bysshe Shelley. It is a favorite of mine. I keep the poem in my psychological database as a reminder that the journey for knowledge never terminates. One’s momentary achievements, should be acknowledged but never glorified. The lone and level sands stretch far and away. Colossus Of Rhodes, a 16th Century engraving by Martin Heenskerck, part of the series The Seven Wonders Of The World . While it does not depict Ozymandias, the picture perhaps conveys the concept of Ozymandias and is another example of the dilatory effects of Ego. The remarkable journey to obtain knowledge has presently brought me to the new contextual paradigm of Kata within my methodology and ideology of Jiriki Kata-Do (The Way Of (attaining) Inner Salvation Through Kata). Jiriki Kata-Do is a new exploration into the hidden secrets of Kata heretofore believed to be the sole province of the martial artist now extended to all followers of my methodology and ideology. I remain, as I hope you do, a journeyman, willing to share the journey with my initiates. To borrow from Shelley, it is my sincere hope that all remain eager to continue to tread upon “the lone and level sands (of knowledge) that stretch far and away”. The reader may wish to consider the evolutionary process of self-discovery as set forth in my article entitled Dante’s Issho Dojo which is filed in the category Martial ideology Applied To Daily Life. For more nformation on my ideology and methodology of Jiriki Kata-Do, please review the articles herein filed in the category Kata as enlightened meditation. For more on either Sanchin Kata as meditation or my new book on Sanchin Kata, please feel free the Sanchin Book page of this Blogsite or visit my website WWW.Dynamic-Meditation.Com. The poem Ozymandias was from Williams, Oscar, Immortal Poems Of The English Language (An Anthology), (Washington Square Press, NY, NY 1952) p. 295. While the within article addresses a specific attribute unique to the Sanchin Kata of Okinawa Karate-Do, I believe it would benefit any reader who seeks inspiration in the daily struggle to endure the difficulties that life puts in our path. By so enduring these difficulties one will ultimately find the wondrous beauty that unfolds along the path of life’s journey. For my Karate-Do readership, I submit that the exact methodology of Sanchin Kata that one practices is immaterial when compared to the importance of the attributes to be learned and encountered through the Kata. Thus, while I learned the Sanchin Kata contained in the Mokuroku No Kata (Catalogue of Kata) of Goshin-Do Karate-Do as taught by Shihan Thomas DeFelice (Ku-Dan, Menkyo Kaiden) the attributes apply equally to the Sanchin methodology of traditional Goju-Ryu, Uechi-Ryu, Isshin-Ryu, Pang-noon Gai Ryu and the other traditional Karate-Do styles. It is my contention that no methodology of Sanchin is superior or inferior to the other. The importance of the Sanchin Kata is the presence of unique attributes to be obtained through regular practice and performance of the Kata and, most importantly, the pure heart of the performer. Within the context of traditional Okinawa Karate-Do one attribute of the Sanchin Kata is that it, inter alia, conditions one physically and mentally to endure pain so as to (when necessary) be able to inflict pain in the course of defending oneself. The ability of Sanchin Kata to allow one to endure physical, spiritual, and I submit, metaphysical, attack, pain or discomfort is exemplified in a poem concerning the water ladle utilized in the traditional Japanese tea ceremony (Cha-No-Yu). I hope the poem inspires all to endure what they feel they cannot. It is said “To bear what one perceives one cannot bear is really to bear.” In this spirit, endure the hardships of life, for in so enduring, the beauty of this wonderful existence will reveal itself. Walk with certainty on your life’s path and perform the Sanchin Kata at least daily with a sincere and pure heart. In developing my ideology & methodology of Jiriki Kata-Do (The Way of (attaining) Inner Salvation Through Kata), I have evolved this attribute of being able to endure pain (physically, emotionally & mentally). The evolutionary result is a new contextual paradigm for Sanchin Kata and other unique Kata of Okinawa Karate-Do. This paradigm is designed to enhance the human condition not only physically and spiritually but also within the metaphysical component of interconnectivity with the universe’s physical environment and consciousness. I have recently obtained the above beautiful digital Hanko seal. It will be used to formalize and seal all future submissions on this Blogsite, my website and all future e-mails. Anyone interested in either a traditional or digital Hanko seal should visit WWW.TheJapaneseConnection.Com. Mr. Ben Falge is a true master of his craft. I first read the poem referenced in this article in the following book: Furuya, Kensho, Kodo: Ancient Ways (Lessons In The Spiritual Life Of The Warrior/Martial Artist (O’Hara Publications, Inc., 1996) p. 155. I highly recommend this book to any martial artist. Furuya Sensei’s insights are truly thought provoking. Though I did not know him personally, I was recently saddened to learn that Furuya Sensei passed away on March 6, 2007 while teaching a class at his Aikido Ceneter located in Los Angelas, California. For more information on my ideology and methodology of Jiriki Kata-Do, please review the articles herein filed in the category “Kata as enlightened meditation“. For those interested in the state of mind of Mushin, you may wish to view my four part article on Mushin by clicking on the category “Martial Ideology Applied To Daily Life” and opening the Mushin series of articles.